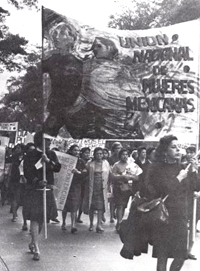 The Tlatelolco Massacre, also known as The Night of Tlatelolco (from a book title by the Mexican writer Elena Poniatowska), took place on the afternoon and night of October 2, 1968, in the Plaza de las Tres Culturas in the Tlatelolco section of Mexico City, ten days before the 1968 Summer Olympics celebrations in Mexico City, when the military and armed men shot student demonstrators. The death toll remains controversial: some estimates place the number of deaths in the thousands, but most sources report between 200 and 300 deaths. The exact number of people who were arrested is also controversial. 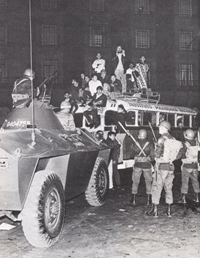 The abolition of granaderos (the tactical police corps). The dismissal of the chief of police and his deputy. The identification of officials responsible for the bloodshed from previous government repressions (July and August meetings). 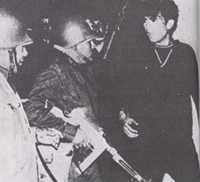 President Gustavo Díaz Ordaz, however, was determined to stop the demonstrations and, in September, he ordered the army to occupy the campus of the National Autonomous University of Mexico, the country's largest university. 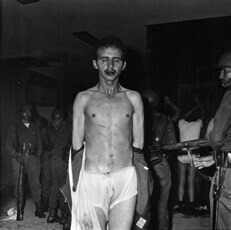 Students were beaten and arrested indiscriminately. Rector Javier Barros Sierra resigned in protest on September 23. Student demonstrators were not deterred, however. The demonstrations grew in size, until, on 2 October, after student strikes lasting nine weeks, 15,000 students from various universities marched through the streets of Mexico City, carrying red carnations to protest the army's occupation of the university campus. By nightfall, 5,000 students and workers, many of them with spouses and children, had congregated outside an apartment complex in the Plaza de las Tres Culturas in Tlatelolco for what was supposed to be a peaceful rally. Among their chants were ¡No queremos olimpiadas, queremos revolución! ("We don't want Olympic games, we want revolution!"). Rally organizers did not attempt to call off the protest when they noticed an increased military presence in the area. 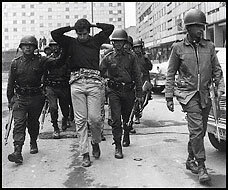 The massacre began at sunset when police and military forces—equipped with armored cars and tanks—surrounded the square and began firing live rounds into the crowd, hitting not only the protestors but also innocent bystanders. 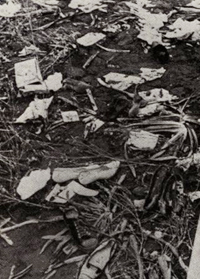 Demonstrators and passersby alike, including children, were hit by bullets and mounds of bodies soon lay on the ground. The killing continued throughout the night, with soldiers operating on a house-to-house basis in the apartment buildings adjacent to the square. Witnesses to the event claim that the bodies were later: first removed in ambulances and later military officials came and piled up bodies; not knowing if they were dead or alive into the military trucks. The official government explanation of the incident was that armed provocateurs among the demonstrators, stationed in buildings overlooking the crowd, had begun the firefight. Suddenly finding themselves sniper targets, the security forces had simply returned the shooting in self-defense.